tags: If you thought it was just a trick of the mind, prepare yourself for the truth. When a bomb explodes on a ferry boat in New Orleans, special operatives from the FBI and ATF come to the scene, including ATF agent Doug Carlin. After viewing satellite surveillance, Carlin also stumbles upon a woman named Claire Kuchever, who has been murdered shortly before the Ferry incident. Carlin also finds out that he can use the surveillance systems to travel backwards in time. So, he time warps 4 days before the Ferry incident, so he can stop Claire's murder, and to stop the Ferry incident. After a ferry is bombed in New Orleans, an A.T.F. agent joins a unique investigation using experimental surveillance technology to find the bomber, but soon finds himself becoming obsessed with one of the victims. Deja Vu is more than a little misrepresented in it's trailer. I mean it is an action film by Tony Scott, it does star a host of big stars including Denzel Washington but the plot and idea is far more science fiction than it ever presents. From watching the trailers I had no idea that Deja Vu revolved around time travel. That being said Deja Vu happens to be one of the best action films of the season with an original, well connected plot, easy to follow but complex and intelligent story line and some strong performances with some small flaws to them. Tony Scott and Denzel Washington had something in common to me...I did not like either of their last films...Domino or The Inside Man so I wasn't sure if the two of them together were my mix but the strong, brilliantly written storyline drew me in. Scott filmed and captured New Orleans like few directors good and uses that setting to really make a difference in the picture and not just use New Orleans "because." Denzel Washington leads the cast as almost too brilliant ATF agent Doug Carlin. Now Washington is a brilliant actor, I have seen him in some brilliant roles but his ego has pretty much seeped into every performance he has and drags down his characters and makes them often unlikeable. Carlin can spot a clue from the ground on the bottom of a bridge in the air. He's just REALLY good at his job which is fine but Washington gives a distinct air of conceit which makes him annoying. But he still commands a certain screen presence so it works. Val Kilmer plays a supporting role, and a good one, as Agent Andrew Pryzwarra who puts together a team of his choice to investigate a brutal terrorist bombing that kills many Marines and their families on a ferry. Kilmer is great and the conceit he once carried with his characters is gone and has been gone since Batman Forever making him a decent strong actor in what he does. I would have liked to have seen more of his character in this film. James Caviezel is dark and brilliant, and downright evil as Washington's nemesis and the terrorist bomber Carroll Oerstadt. Paula Patton is also fairly good as the victim of the bomber who just needs her out of the way. Small clues are dropped randomly right from square one in the film that won't be connected or make sense until the very end of the film. Time Travel doesn't truly happen until almost 3/4 of the way through the film but still the story is being set for the future plot. Time Travel films can be very difficult making sure things match up and dealing with time paradoxes and the likes but Deja Vu does a very good job keeping tabs on the details. Throw in a few very thrilling car chases and an even more thrilling murder mystery and it makes for one of those must see movies that come out every once in awhile. 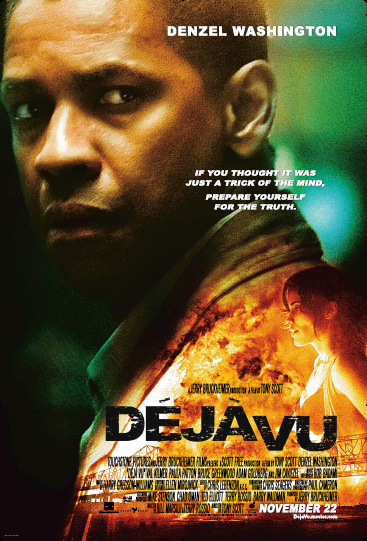 Deja Vu is a strong action, intense thriller and well worth your theater money, or rental when times comes. 9/10 I kept my hopes low for this mediocre time machine movie and my expectations were not exceeded! I realize the filmmakers are solely in it for the money. Film is now, for the most part, a commodity like toothpaste and paper towels - and it shows! I wouldn't even be surprised if Hollywood stooped so low as to hired Public Relation firms to write fake positive reviews on internet sites like this one!